This part of the window serves to introduce basic parameters of soils - unit weight, angle of internal friction and cohesion. The particular values are obtained from geotechnical survey or from laboratory experiments. If these data are not available, it is possible to exploit built-in database of soils, which contains values of selected characteristics of soils. The characteristics of rocks are not listed in the database built, these parameters must be defined manually. Approximate parameters of rocks are presented in the theoretical part of the Help herein. 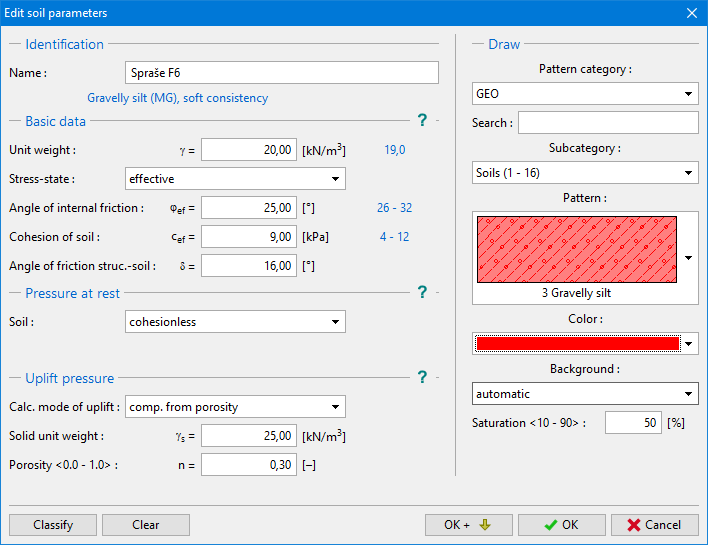 Either effective or total parameters of the angle of internal friction and cohesion are specified depending on the setting in the "Stress analysis" combo list. Whether to use effective or total parameters depends primarily on the type of soil, type of load, structure duration and water conditions. For effective stress further needs to specify the angle of internal friction between the soil and structure, which depends on the structure material and the type of soil. Possible values of this parameter are listed in the table of recommended values. For total stress further needs to specify the adhesion of soil to the structure face a. The associated theory is described in detail in chapter "Earth pressures". Dialog window "Add new soils" - "Basic data"